Our farm is currently home to 47 alpacas. Our yarn is 100% alpaca made from our animals, we pay very close attention to producing very good fiber and as a result, exceptional yarn. Our yarn and fleece has won several awards along the ease coast in Spin Offs as well as skein competitions. The majority of out yarn is the natural color with the exception of some skeins that are hand dyed to offer a variety of colorful options. Every skein comes with a tag showing a picture of the animal that produced the yarn. We also carry bags of natural alpaca roving for spinning and felting. Empty Pockets offers some quality alpaca items such as socks, hats, throws, gloves in limited quantities for those that want to enjoy alpaca without the work of creating it themselves. To complement our handmade alpaca scarves, wraps, and shawls we now offer clasps. These clasps are made from glass and metal and are one of a kind designed and created by a member of the Empty Pockets family! We currently have 37 Huacayas and 10 wonderful Suris. Each and every one of our alpacas is special in their own way with unique personalities, likes and dislikes. Our herd receives daily turnout and attention from our family making them easy to handle and accepting of humans of all ages. We believe in our animals having daily turnout time to graze on open fields and given the chance to romp and play while still having daily interaction with us. Empty Pockets prides itself on the attention to nutrition, herd health maintenance and quality fleece. We breed with careful consideration to confirmation, fleece, and personality. A sampling of the notable bloodlines running around the farm for Huacaya alpacas include: 4-Peruvian Black Epic, Peruvian Victor G4563, Peruvian Guellermo, G4546 Peruvian EL Patron, Peruvian Pluro G4571, Royal Peruvian Challenger, HG Lord Byron and Peruvian Bueno in our Huacayas. Our Suri bloodlines to mention a few include PPeruvian Bruxo, PVA Mahogony Prince, Captain Morgan, Peruvian Fuego, PVA The Prince of Ghiradelli to name just a few. All of our alpacas are ARI registered, BVD negative and micro chipped our alpacas have won awards in various AOBA recognized shows in halter, fleece, and in spun categories. Empty Pockets would like to help you in selecting the perfect alpacas for your needs. We offer a variety of financing options, as well as package pricing. We would love to work with you start your family of alpacas. With the exceptional quality that our animals offer, you will have several options open to you for your business. Whether it's fiber, breeding, pets, showing or investment... our animals will fulfill your expectations. 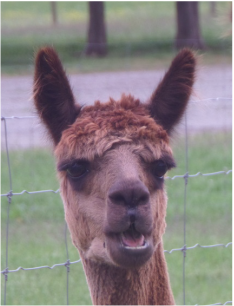 Please look around our site and give us a call-we love to talk about our alpacas. Alpacas are a wonderful addition to your lifestyle whether you are looking for a family experience or financial investment which includes the substantial tax advantages. Our Store offers award winning mill spun yarn from our herd as well as alpaca wearable items. We can show you the animal that the skein of yarn is made from. We also offer in the store wonderful alpaca items such as scarves, shawls, hats, gloves, socks to name a few! We would be happy to answer any questions you might have and schedule a farm visit. Check back for latest news on Empty Pockets Alpacas.